When we were little and I needed Warren, I would rub my earlobe. And perhaps it was the alchemy of childhood, a magic that happened because I believed it could, but I swear it worked. He always came. A very emotional book for many reasons, I loved House of Wonder for its very real, very heartfelt story. The novel was one that broached many uncomfortable topics with an entirely human approach. I couldn't help but feel for, and with, the characters because their stories became so true and poignant. The story and heartbreaking circumstances and life of Jenna was utterly compelling to me. A lot of the things were not things I could imagine as I had never gone through them but I could see the possibility of them having happened which is the essential part of this book. The book went back and forth, revealing secrets and past events until everything came together. 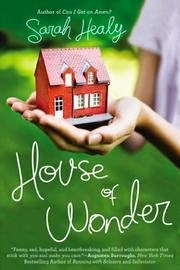 What I truly loved about House of Wonder was the fact that I just did not want to put it down. It is so beautifully written and the story appealed to me so much. It felt authentic and despite the myriad disappointments and troubles in the characters lives, or perhaps because of them, it resonated with me in a very profound way. Thank you to NAL Trade Paperback Original for our review copy. All opinions are our own.